There may be times when you want to make changes to a document, but not take the chance that the changes become permanent. To avoid affecting the original document, you can create a clone of the document, and we’ll show how to easily do this. There are a couple of ways to open Word. 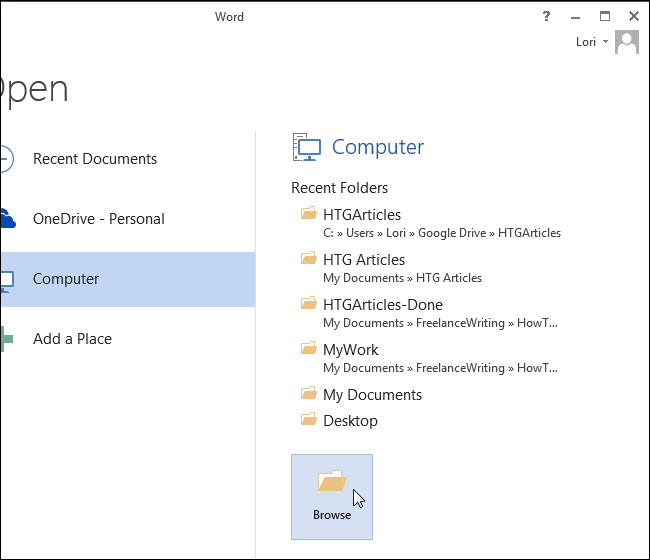 You can open Word by running the program (from the Start menu, Desktop, or Start screen) or by double-clicking a Word document file (.docx or .doc) file. When you open Word by running the program, the “Recent” list displays on the left side of the backstage screen. 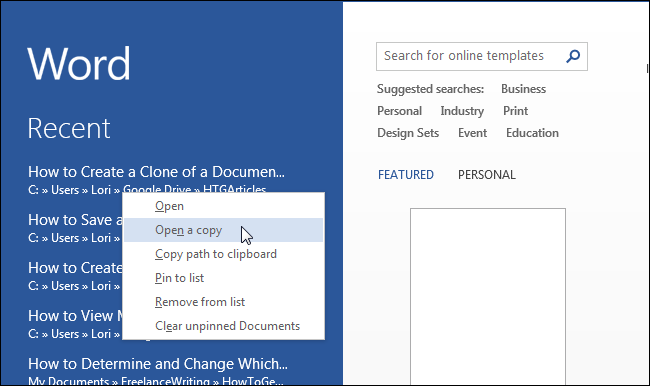 If the document you want to open as a clone is in the list, right-click on that document and select “Open a copy” from the popup list. If the document you want to open as a clone is not on the “Recent” list, click the “Open Other Documents” link at the bottom of the list. 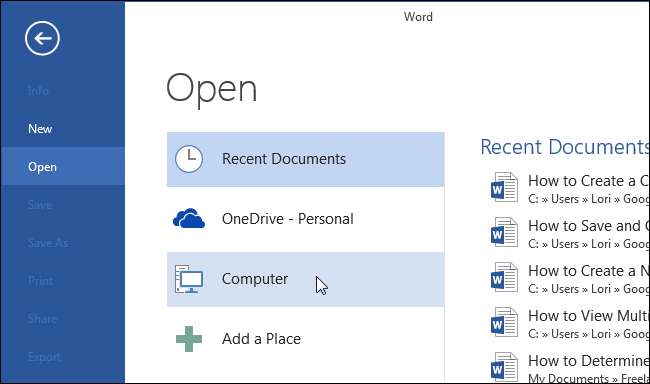 On the “Open” screen, click “Computer” if your document is on the local hard drive or “OneDrive” if your document is in the cloud. On the right side of the “Open” screen, a list of “Recent Folders” displays. If the folder containing your document is in the list, click on the folder name. If the folder you need to access is not in the “Recent Folders” list, click the “Browse” button under the list. On the “Open” dialog box, navigate to the folder containing the file you want to open as a clone, if necessary. 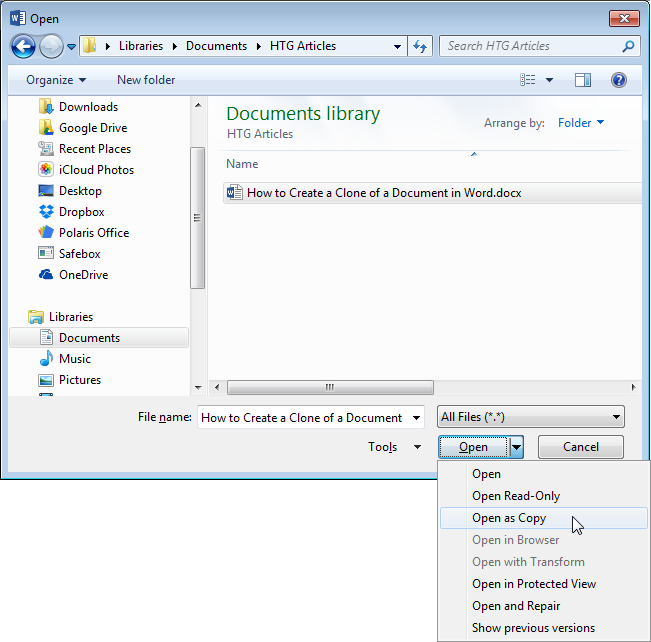 Select the file you want to open and, instead of clicking the main portion of the “Open” button, click the down arrow on the right side of the “Open” button and select “Open as Copy” from the drop-down menu. A clone of the original document is created in the same folder as the original document and opens. The clone document uses the same file name with a prefix added to it, such as “Copy of” or “Copy (1)”, as shown in the image below. You can rename the file using the “Save As” command on the “File” tab or by renaming the file in Windows Explorer after closing it.